Last Sunday, Ryan Moore claimed his 5th career PGA TOUR victory at the John Deere Classic. In his post-round press conference, Moore discussed the importance of health and gave partial credit for the victory to TPI Certified trainer Brian Chandler, who had just helped him overcome an ankle injury that had bothered him for the last five years. We asked Brian if he'd share a bit more detail about the work that he and Ryan had done to improve the function of his ankle. It's a phenomenal testament to the power of evaluation, targeted training and teamwork. I started working with Ryan about 8 weeks ago. Our relationship was built on a few relationships that linked us together. I am currently the movement and performance coach for UNLV Women’s Golf team and I just began the process of working with the Men's Team with movement assessments. 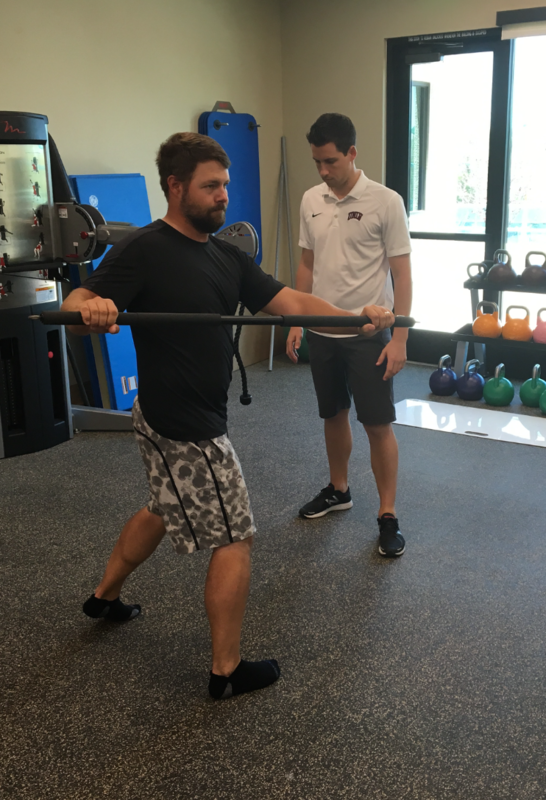 We have two performance facilities in Las Vegas called Anthem Fitness, which is owned by Dr. Josh Satterlee (a TPI expert and seminar instructor). Dr. Satterlee is my medical expert in the field of golf performance while I run the rehab, fitness, and developmental programs for our golfers. We have built a great team of golf instructors around us as well in Las Vegas to give the best care to our athletes. One of our facilities is located at TPC Summerlin where Ryan and several other professionals call home. Dr. Satterlee was there one afternoon talking to Charlie Hoffman (another former UNLV Rebel) and Ryan walked in to our recently opened facility to check out what was going on. Josh thought it was a good idea to introduce us to see if there was anything we could do to help is game. As I began my initial evaluation process with Ryan, he was very specific with what he was looking for with regards to his ankle, but had no idea where to start. Timing is everything when developing a program for any athlete. Our challenge was that Ryan was right in the middle of his tournament schedule and had to continue to play at a high level while making some important changes before they continue to get worse. He made a commitment to take three weeks off to completely rejuvenate his golf game to get ready for the Open, PGA, and final events of the season. He was committed and determined to make a change which meant I had a three week window to implement a program that would help him trust his body again. 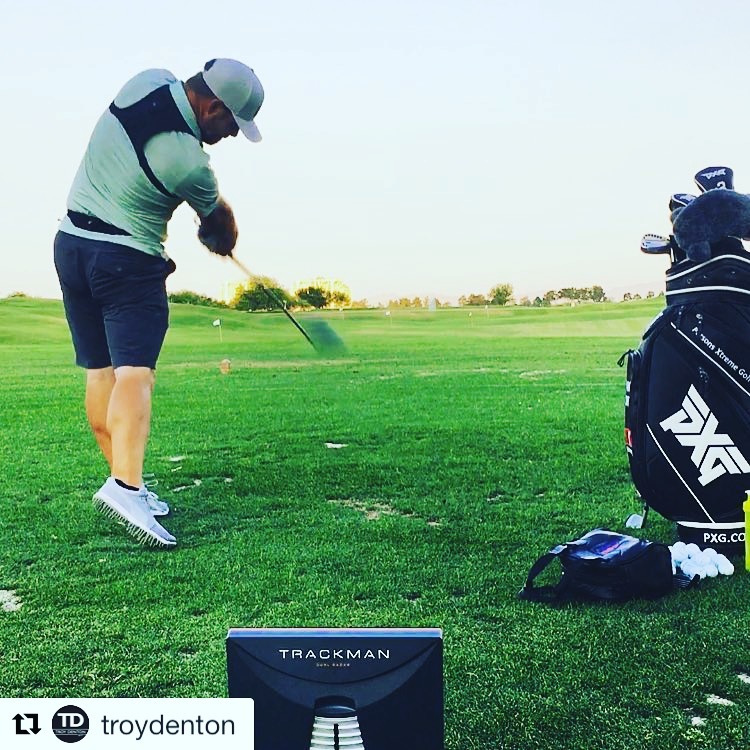 We started on an intense schedule of four days/week for two hours/day in the gym, in addition to range sessions with his swing coach Troy Denton out of Dallas, Texas. Troy played golf with Ryan at UNLV and knows his swing better than anybody. His technical knowledge onTrackMan and coaching was essential to making the type of changes we were going after. Ryan's journey started with a comprehensive evaluation. He told me about some of thechronic pain/soreness he'd been dealing with in his left ankle for the past 5 years. He also mentioned some stiffness in his back and hips. My evaluation process included FMS, SFMA, TPI movement/strength/power screens, K-Vest 3D measurements. After our testing was complete it was clear where we needed to focus our attention. He lacked mobility and strength in his left ankle and it was clear when comparing it to his right ankle as we measured dorsiflexion actively and passively. I described it to him as trying to play golf wearing a ski boot. 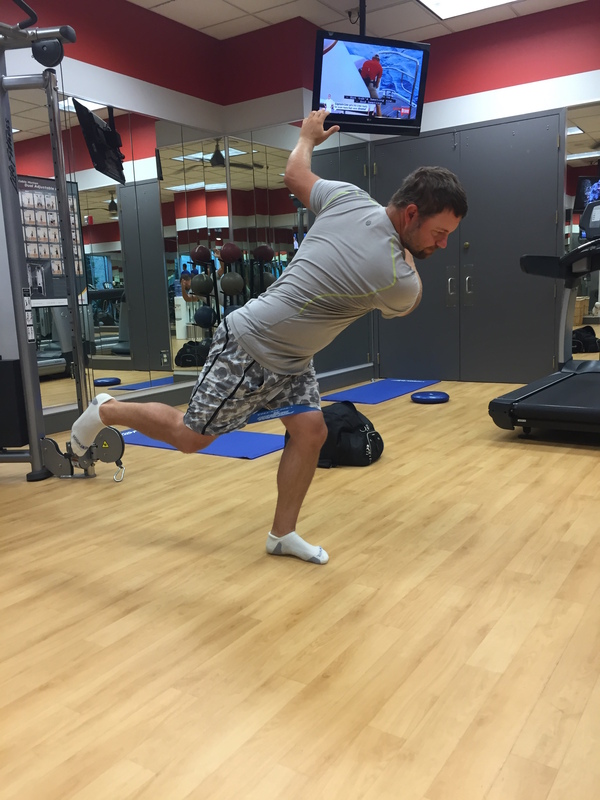 Having proper mobility and strength in your ankles is crucial in the golf swing so we made a plan to “build him from the ground up." He also had serious loss of left lateral hip stability that affected his rotation, pelvic control, and overall power output. The key aspect of this process was visiting with his swing coach Troy Denton. I had a gameplan on what we needed to do physically, but it all came together when we hit the range at TPC with Troy to really see what was happening. Between the TrackMan and K-Vest measurements, we had tons of data that allowed us to see what body movements led to some of his common swing faults. He would describe his impact position as being “stuck” and “under” and having zero lead ankle/hip support really makes an aggressive rotation not only difficult but painful in Ryan’s case. Our mission was to build a solid “bracket” from ankle to hip to build him a strong lead posting leg to handle his aggressive rotation. All of the corrective rehab started at the ankle. We did intense manual therapy on the ligaments around the ankle, calf, and bottom of the foot. We then started to load the tissues isometrically in all ranges of motion. We progressed his tissue load capacity as much as we could every day to get him to trust it again. We also tackled his left hip working on pelvic side bending, pelvic titling, and rotation. Westarted with basic low threshold exercises such as clamshell progressions, mini band exercises, tall/half-kneeling lifts/chops, all the way to hip hikers and a ton of functional range conditioning (FRC) to work on his end range control. As he mentioned in the press conference above, he actually texted me on the Monday of the John Deere to say it was the first time in five years that he didn't even think about his ankle during a golf tournament. Ryan is a 100% feel player and doesn't like to get into the technical side of the game. He isn't really interested in the numbers of this or that, but just wants to create a feel that he can use to produce a good golf swing. Knowing your athlete is what coaching is all about. We are continuing to progress all of our work throughout the season providing on site care. Its really rewarding when our athletes understand the importance of taking care of their bodies to perform at the highest level every single week. Huge congrats to Ryan on the win. It's an honor to be a part of his team, but all the credit goes to him for making a serious commitment to improving physically. Brian Chandler is a graduate of Florida Golf Coast University with a degree in Human Performance. 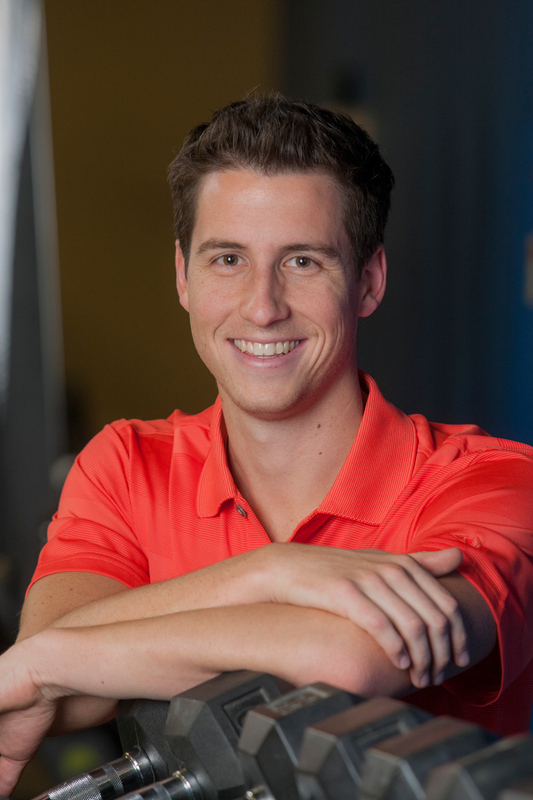 Brian is a certified Strength and Conditioning Specialist and Licensed Massage Therapist. Brian is a certified Full Body Active Release Techniques Provider and is TPI level 3 Certified. Continuing education includes FRC, SFMA and FMS. Follow him on Instagram at @bchandla1. Follow Anthem on Facebook. Great job Brian. Enjoyed the article. Very impressive functional improvement, Ryan winning on the tour.